ANA set to claim 787-9 bragging rights? 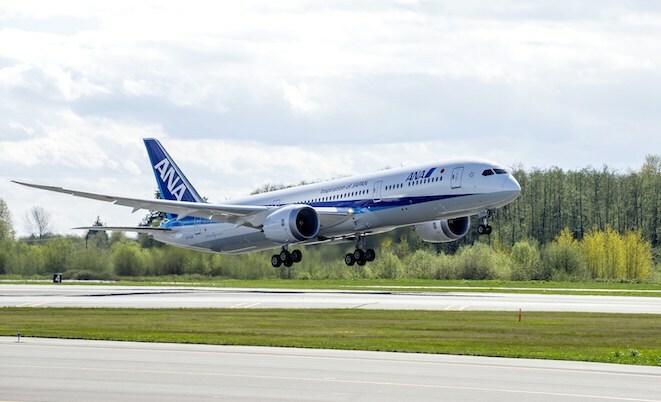 Japan’s All Nippon Airways looks set to pip Air New Zealand to the line as the first operator of the Boeing 787-9 on a scheduled commercial flight. ANA’s first 787-9 flight will take place on August 7, with NH241 due to depart Tokyo Haneda at 0725 local time bound for Fukuoka, the airline announced on Thursday. The aircraft will also make trips to Osaka and Matsuyama on the first day of operations. August 7 is two days before Air New Zealand’s scheduled first commercial flight from Auckland to Sydney on August 9. ANA will also be the first airline to fly both versions of the Dreamliner, having been the launch customer of the 787-8 in 2011. While ANA’s 787-9s used on domestic flights have 395 seats, the airline said those configured for international services will be fitted out with 215 seats, comprising 48 in business class, 21 in premium economy and 146 in economy. The internationally configured 787-9 was expected to be used on long-haul routes to Europe, North America and other key destinations, allowing the carrier to either add capacity by replacing the 787-8 or down gauge from larger aircraft on existing routes. “This will help ANA to maximize commercial returns, stabilise operating costs and enhance its ability to win more passengers and bigger cargo demand,” ANA said. Air NZ was the first to take delivery of the new aircraft, when the all-black painted ZK-NZE landed at Auckland Airport on July 11.